Bots, chatbots, robots – whatever we call them, conversations in which there is no human on the other side but artificial intelligence instead, are more and more present in our daily lives. The future is now, as a wise man said. At what stage of the general development of artificial intelligence are we right now? Is it possible, and if so, when the machines will run all the customer support? How exactly does the creation of an online customer service bot look like? Artificial intelligence is, without doubt, a crucial part of modern business. The potential of machine learning makes the vision of implementing AI into organisation structure somehow seems tempting to most entrepreneurs, especially when it comes to customer service. According to Gartner, by 2020 until 85% of customer service activities will not require human interaction – which means that bots will take over a vast majority of recurrent processes. Today, it is only natural for us – just think about shopping online. How do we do it? Browsing models and sizes on the website, comparing prices, and quick online payments. The example above is a simple shopping process not including any questions or additional comments from the customer. However, even if issues arise, bots turn out to be more and more of a help. They are getting more and more popular in online customer service. Why bots in online customer service? Because client support processes (questions, complaints, suggestions) are repeatable and can be defined in a certain structure. A nicely designed AI bot is able to learn them easily and then recreate on a scale and with a speed exceeding human capabilities by thousands of times. 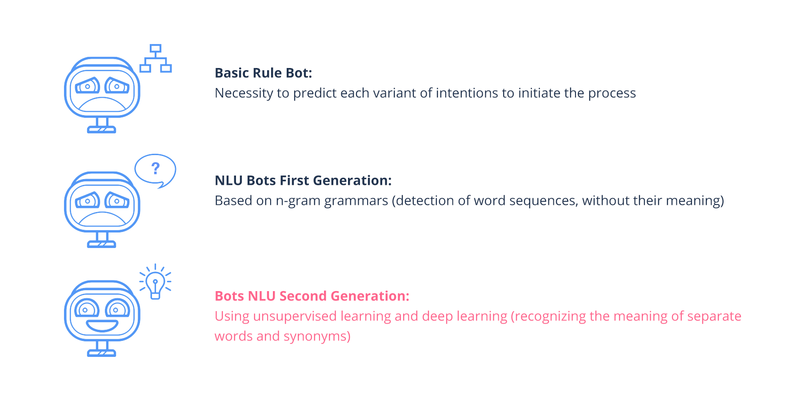 As soon as we teach the bots natural language processing (in other words, when they can recognise the meaning of words and synonyms in common language), they will be able to answer such questions. Both in public channels as well as addressed directly on brand’s social media, e.g. by messenger or on-site chat. The key to success is to make the bot understand the intentions correctly. Considering the specifics of many languages and different ways of expression (such as idioms or sarcasm, which sometimes confuse even humans), this is difficult but of course feasible. A task we, as SentiOne, have been successfully working on for a few months now. In 2015, there were more instant messenger apps users than social networks users globally. And applications like Facebook Messenger or WhatsApp are developing very dynamically, often being the first choice, leaving behind older technologies like telephones. It turns out we use message apps more often not only when reaching out to a friend but also to the companies’ client service. Not to mention the Chinese WeChat, which combines both communication and social functions, as well as shopping and payment functions – all using bots. Bots are also more and more popular at Messenger – last year IBM reported that there were 34,000 accounts with automated answers set on the chat channel. It was the development of deep learning technology and information processed by machines that made 90% of the data humanity produced in the last two years. Knowing this and willing to optimise costs, 30% of companies from the B2B sector admit that by 2020 they will implement artificial intelligence in the sales processes. How do we know that the bot industry is peaking? Intrigued? We are happy to answer all your questions. Bartosz Baziński COO at SentiOne. Software engineer, entrepreneur, passionate about applying cutting-edge technology to the world of business. Expert in online data extraction. Since 2011 directing the development of AI-based online listening and customer management systems. Translations are now available in SentiOne!